It is often quoted that good things come to those who wait, a sentence most readers may have heard at some point in life, and if not then by typing that phrase into a search engine you get no less than 915 million results. A powerful sentence indeed, and as such with a lot of things in life there will always be exceptions to this rule. However, the game that is being looked at today is one that was released 8 years into the NES system and although may not have been a game people were knowingly waiting for, then by golly (an exquisite phrase seldom used by reviewers these days) did it make an impression. Not many games can have such an effect 8 years after the release of the console, especially one in which the hero comes crashing in on a star and devours all that it sees and has the ability to have 24 differing special abilities. So for today’s review, we are looking at the one and only Kirby’s Adventure. Kirby’s Adventure is a side-scrolling platform game released on the NES in Europe in September 1993 and the second game in the Kirby franchise, though Kirby’s Adventure was the first foray on the NES. The idea is to complete the stage in a standard classic platforming manner however in this game what sets Kirby apart is the ability to copy the special ability of certain enemies encountered. This can take the form of sword-fighting, lasers, throwing enemies amongst others – 24 in fact that you could encounter across the whole game. As the player, you help Kirby travel across Dream Land to repair the Star Rod after the protagonist King Dedede breaks it apart and gives pieces to his minions. Along the way there are mini games that break up the adventure and assist in providing extra lives and bonus points – who doesn’t like bonus points? Anyway…at the menu screen you get the choice of three save files akin to Legend of Zelda, so at least friends or family can start a file and not ruin their game with your one. You start off at level 1, Vegetable Valley and proceed through the first door. Upon completing each level which are standard platforming levels that you would recognise from the likes of Mario, more of the level select screen is revealed, revealing more levels to complete and also along the way bonus games to get more lives and even change the special ability you have. Once the majority of the map is revealed, you are set to face the world boss which is not the most difficult but does require some thinking at times and sharp reflexes. After each stage, the player plays a Goal Game where Kirby jumps on a spring platform. The goal is to press the button when the platform is at its lowest-this sends Kirby to the top level and nets a 1up. Otherwise, the player scores points, the higher up you get the more points you get but is dependant on how close the timing is to perfect. Playing as Kirby in Kirby’s Adventure is not as straight-forward as you think when you first play the game, especially if you have never played a Kirby game before this or played as Kirby in a game such as Smash Bros before. Moving Kirby left and right is easy enough, but then pressing up not only causes Kirby to jump but by holding the up button you can continually float. Beware though, you cannot just float your way through the whole stage as there will be aerial attackers and other nasties trying to hurt you. Pressing the B button does a jump which you cannot then float with, it is a straight forward jump. Button A is how Kirby proceeds to “attack” – he inhales. That’s right, a character who hoovers up his enemies like Yoshi does. What is with these characters who hoover up enemies and dispose of them so callously? Anywho, when the enemy is swallowed, you either press the A button again to spit out the enemy as a star or the ability to copy the special move of the enemy you have inhaled. Not all enemies have special abilities – if this is the case on screen it says “nothing”, but one of the joys is discovering the different abilities you can copy and use to your own advantage. Should you get hurt by an enemy, you lose that ability which shows as a star bouncing about, and have limited time to re-capture it otherwise your back to inhaling enemies. In total there are 24 abilities to copy from different enemies, so have fun finding them! There often comes a video game that can’t quite decide what it wants to be and what genre it so delicately plops itself in. Is it action? Is it platforming? Is it action-platforming? Is it “plactioning”, if such a hybrid exists? (For the record, if any game company uses “plactioning”to describe their game then royalties will be gratefully received here…). With today’s technological advancements, the envelope of gaming and the experience of gamers is being blurred more and more, with games being harder to define in one specific genre. Aside from FIFA, everyone knows where they stand with FIFA. But way back when in the mid 80’s, games knew what genre of gaming they were – there was no confusion and no hybrids which sound as awesome as they are #plactioning. As always in life however, there are exceptions to the rules, and today’s review focuses on one such game that that could walk the tightrope between two such genres in a subtle way (which is always the best kind) and was released in the infancy of the NES. The game in question is Wrecking Crew that features everyone’s favourite plumber who never seems to plumb. So looking back now, was the game Crew-sing it’s way to being a classic or heading towards being a Wreck…. Wrecking Crew was released in 1985 as a launch title for the NES and straddles the line of being an action game but in certain aspects also a puzzle game albeit not in a traditional sense. The aim is to control Mario (wearing his fetching all-red overalls) who in the game is acting as a demolition man in order to destroy objects that features in the level with his mighty hammer. This can be in the form of walls, pillars, barrels, bombs etc. As a result of the weight and the power of the mighty hammer, Mario bless him cannot jump therefore there will be occasions where the old grey matter needs to be used in order to destroy every occurrence of that item in the level but the most obvious way of doing this is not clear. There are 100 levels in the game in order to complete so at least there is somewhat of a challenge especially when you can start the game at any level from the title screen, so it is good you don’t have to start over from level one repeatedly in order to progress. The game is also noted for having a level editor, similar to Excitebike so you can create your own levels to amuse and antagonise friends with and store them on the Famicom Data Recorder. The problem with that is that the Recorder was only available in Japan, therefore this feature was redundant outside of Japan but still it was good to have the option, and if you have people over at least they can play your creations even if it cannot be saved for later usage long after they have left. When you turn on the game on there is no fancy introduction sequence, no developer titles and no faffing about – straight into the main menu. There is something to be said for games that don’t dilly dally and head straight to the good stuff, which seemed to be quite common on the NES. You have the option of starting the game in 1-player mode that features Mario, a 2-player option that features everyone’s second favourite plumber who never plumbs but wears a delicious green number, Luigi. Third and finally, you can go into the level editor mode and create your own levels as noted earlier. With the two player option, this is similar to how Super Mario Brothers played in 2 player, where both players alas are not on the screen at the same time, but is played one character at a time. This does mean the other person sitting round and waiting for their chance to shine, or in this case demolish. As soon as you start the game, you go straight to the good stuff and can start demolishing away, climbing up and down ladders and hammering away. It does seem as though most of the time the idea is to destroy everything, so a piece of advice is to destroy everything you can, but in a thoughtful way in case you need a certain path later… There is something oddly satisfying with destroying the landscape you are in, and starts off relatively simple but progressing in difficulty when trying to find anything and everything to destroy with your hammer in certain parts of the level. The controls are as straightforward as they come – the d pad moves Mario left and right, and can also climb up and down ladders. The A and B buttons make Mario (or Luigi) wield his hammer and destroy the items on screen. The controls do seem responsive and encounter no significant lag or delay when pressing the button to hammer away and for your character to action this. Although speed of input is not the most crucial aspect of the game, it is still good knowing the controls are as tight and responsive as they are, safe that any deaths that occur are not due to the fault with the controls but of that of the player. It is also noted you can wrap around the stage just by going off-screen and appearing on the other side – a nice trick that certainly does help out when trying to complete the level. Music-wise, there is nothing on the title screen when you boot up the game, but as soon as the game kicks in the music is jaunty and jovial and sets a positive tone and a pleasant gaming experience. It may not be the most memorable music on the console especially within the black box games released, but still it is jaunty and positive enough that you would rather listen to this then some of your old cassettes lurking in the back of your wardrobe. The sound effects too are some of the better sounds that are found in the early NES library, varying in pitch, tone and compliment well to the music playing in the background, so again it is something to behold (or be-listen) when playing the game. Overall Wrecking Crew is one of the better offerings of the launch titles on the NES that is highly recommended to play. There is enough action going on to keep the gamer interested, with just enough puzzle element to it to keep the brain meats working overtime in order to clear the level of the items that needs to be destroyed. Wrecking Crew may be overlooked for some of it’s more famous black box brethrens that got released *ahem* Super Mario Brothers *ahem* however this shouldn’t detracted from the playability of Wrecking Crew. The control are tight, graphics are bold and striking and has 100 levels to quench your appetite for destruction with good music and sound effects to boot. Copies of the original cart are not the cheapest black box NES game on the market, roughly going for £20 for the cartridge alone on certain auction websites. Support your local retro game shops kids! Failing that, the game was released on the Wii Virtual Console in 2007 (which is now sadly defunct) and also on the Wii U Virtual Console so you still have the opportunity to download the game and try this yourself. Time will tell whether it comes to the Nintendo Switch Online service, which one can only hope it will as the game is ripe for local/online multiplayer action and deserves a bigger spotlight shone on it. Yes on the original cart you cannot save the levels, the puzzle element may put of some players who like button-bashing action and two players cannot appear on the screen simultaneously which is a shame, however despite those reasons it is a fun game and one well-worthy of your time. Happy destructing all! Top Gun is a video game based off the 1986 movie of the same name, that was released on the NES by Konami in North America in November 1987 and one year later in November 1988 for those in Europe. Those lucky lot. The idea of the game is that there are four missions to complete, starting off with a training mission before progressing to the real meat of the game, shooting down planes in the sky, landing on aircraft carriers, destroying enemy aircraft carriers and also blowing up enemy space shuttles. Whilst attempting to destroy aircraft carriers and planes, they of course are attempting to shoot missiles at you preventing you from completing your duty, generally making nuisances of themselves. The view you have in-game is from the cockpit, making you feel you’re at the heart of the action and can see the enemy planes in the sky and the aircraft carriers down below, rather than being side-scrolling and not feeling like your at the centre of the action. It is touches like that which are welcomed. Upon turning the game on, from the moment the opening credits roll you’re treated to the theme from Top Gun which does sound admittedly well done. If the sights and sounds of the film pumped you up, then the 8-bit rendition in the opening credits does a great job replicating that feeling. Even when you leave the game to run the opening demo, the music is fast paced, rock-inspired and does sound really good – in fact although you the reader cannot see this for yourself, the opening music is being played as this is being written. But you didn’t spend your hard earned cash on a video game to listen to the music and never play the game did you?! Some of you might…but anywho, you press start and are treated to a lovely image of a F-14 Tomcat fighter preparing for take-off, with sound effects reminiscent of the Atari 2600, with it’s ocean waves sounding like nuclear explosions. You’re then taken to a screen where you can select from one of the types of missiles you can use in-game. What is handy is that it doesn’t give just a generic name and the quantity of it that you have – it shows you how powerful it is. This is where the choice lies with you, the gamer. Do you pick a missile that you have more of in terms of quantity but less powerful, or a more powerful missile but less of them? Decisions decisions, personally the middle route is always favoured however the choice as they say, is yours. You pick your missile, and head up to the skies to start blasting enemy planes and missiles that they shoot at you. The controls are simple enough, with the A button being your unlimited standard gun, B button being your missile that you have limited quantity of. The d-pad is standard *for a flying game* – this is noted because left and right inputs are simple enough, moving your plane in that direction but pressing the up key makes your plane descend in altitude, and the down key making your plane ascend in altitude. If you are used to plane games this should be second nature to you but if this is the first time playing an aviation-type game, this may take some getting used to. The controls do feel tight although bear in mind that your standard gun can be used anytime but your missile can only be used when locked on an enemy which is shown by a cursor onscreen. As noted earlier, the music in this game is on point, and gets you in the mood to be Maverick yourself. The sound effects however, bland and monotonous and makes you want to use the ejector seat. Flying round to a constant dull drone, broken up by planes flying past and the sound of your gun being fired isn’t the most appealing. If it wasn’t for the fear of missing the awesome-rock based music between levels it would be better putting on the Top Gun Soundtrack and listening to that instead. The graphics, well to be fair in-game they are not the most inspiring. The backgrounds are solid blocks of colour that have little detail in them, the clouds look like popcorn and the planes look okay but there isn’t anything visually that would “take your breath away”. As noted in the introduction, one of the most memorable parts of the game comes right after completing the training mission, and that is landing your plane on the aircraft carrier. For those of you who have watched other gamers or reviewers playing the game and thought how easy it looks to land the plane, please try it for yourself. The barrage of instructions barked at you on-screen in a short space of time is enough to put the heebie-jeebies into anyone, with it’s “SPEED UP” or “RIGHT! RIGHT!” at the merest hint of an input on the d-pad. At this part, you have to not only control your altitude (which is straight forward enough) but also control the angle in which your plane lands on. You’re constantly monitoring the altitude and speed on the left hand side, whilst also trying to follow the instructions in the bottom centre part of the screen – it is enough to actually put this reviewer off being a plane-driver or fighter pilot in real life. Sometimes as well, it says “UP UP” or “DOWN DOWN”, but does that mean the plane has to be down in angle, down in altitude, or pressing the down d-pad? Some people will read this and think that the plane-landing part is easy, or that it can be done 99 times out of 100, and if you are one of those people then nothing but the greatest of respect to you. Even if you cannot land the plane, you still move on to the second level which then makes you think “What was the point? My plane crashed in the sea” or “I overshot the runway” but here you are starting the next mission blowing up enemy aircraft carriers? As well, there is the refuelling parts of the mission that require precision inputs and an equal sense of frustration but this seems to get overlooked too in favour of the more famous landing sequence. There is something natural and organic about wrestling games over the years. Starting off with the very most basic Pro Wrestling (which has been reviewed here), the games have developed into multi-faceted beasts with such advanced complex controls and game modes that would render the most fussy of wrestling gamers salivating with choice. It wasn’t always like this though, for professional wrestling (or should that be sports entertainment?) video game fans. Sometimes you had to just make do with whatever game mode the game developers gave you. Case in point? Today’s review – WWF Wrestlemania Challenge on the NES. WWF Wrestlemania Challenge is a professional rasslin’ (Sorry, Wrestling) game released in 1990 for the NES and features nine of the hottest stars in the WWF at the time: Macho Man Randy Savage, Ultimate Warrior, Ravishing Rick Rude, Brutus Beefcake, Hulk Hogan, Andre The Giant, Big Boss Man, Hacksaw Jim Duggan and finally Yourself! Yes, for the first time in a professional wrestling video game you can play as yourself, but not being able to customise any part of the character. Still, it is a nice feeling that you, the player could go one-on-one in the ring with a wrestler and have a chance of winning. The point of the game, like any sport (sorry, “professional entertainment”) is to beat your opponent and win the match. How, well by mashing buttons and beating seven bells out of your opponent of course and pinning them for the win. Or, you could throw your opponent out of the ring, pummel them there and get back in the ring before the bell counts for 10. When you turn on the cartridge you’re treated to a lovely visual of the Ultimate Warrior which to be fair graphics-wise is a good likeness. Yes the game was released in 1990 after such visual treats as Super Mario Bros 3 was released, but up to this point in terms of realism and graphics it wasn’t the strongest point of the NES. When pressing the start button you get treated to the first set of options, whether you want to play 1 player vs the computer, 1 player vs 2 player or 1 AND 2 player vs the computer. It’s great when an NES game allows two players simultaneously on screen but the added bonus of the two of you versus the CPU is an added treat. When you have chosen your option, you get to choose one of the nine wrestlers listed above and then what type of match it will be: Singles match, tag match or survivor series which is three-on-three. There is a variation between you picking Yourself as a character or a named wrestler. If you pick Yourself, one of the game modes you can pick is Super Challenge, consisting of you going against every wrestler one after the other in order to win. This feature is not available if you picked a named wrestler, instead the Super Challenge is replaced with a singles match against an opponent of your choice. When playing the match, the camera angle is of an isometric view, favoured by such games as Marble Madness and Snake Rattle N Roll (both of which were Rare games, such as WWF Wrestlemania Challenge – sensing a pattern here…). As a result, when controlling your character pressing the right button on the d-pad makes your character go bottom right, pressing down on the d-pad makes your character go bottom left and so on. Personally, it’s not a favoured control scheme and would like the option of choosing whether you control at a 45 degree angle or 90 degree angle like you can pick on Marble Madness. However, the controls are more advanced than previous wrestling games at this point. The A button does a physical move such as a punch or headbutt and the B button grapples the opponent to a more advanced move. Double tapping left or right makes your character run and then do a running move by pressing A, and pinning the opponent is with the B button. So controls-wise it is a welcome improvement on previous incarnations. As touched upon earlier, graphics wise the game has gone up a belt (every pun intended) and look a lot better than WWF Wrestlemania. The characters have a resemblance to them and even in-ring you can see a likeness which does make you think you are watching Hulk Hogan or the Ultimate Warrior. The crowd do have generic faces but with different coloured hairstyles but it’s nice to feel you are preforming in front a crowd that isn’t faceless. You’ll notice a stamina meter as well on the bottom of the ring – every time you get attacked your stamina meter goes down. However by running around and attacking your opponent your stamina meter can be replenished. In some respects this is good as you have a chance of getting back into the match if you have been attacked but as a result this can lead to matches been longer and more drawn out which some gamers may not enjoy as much. It is difficult as this was one of the first wrestling games that had this feature so the decision had to be made whether the stamina meter goes down and never gets replenished or whether this does go back up over time. So overall how does the game fare in the passages of time? To be honest, the fact the moves became more advanced, the graphics became better and the choice of nine characters to pick makes it one of the better wrestling games on the console. At times the game can be tough and challenging with no password option or save feature so it is a game with which you have to sit down in one shot and defeat the other eight wrestlers to become the best in the business. The game is better than WWF Wrestlemania from 1989 but is it as good as Pro Wrestling? That is a difficult choice, it comes down to whether you like playing as made up characters or those you recognise from the TV. It is the same question that football fans had when playing a game such as FIFA with real names compared to games like Sensible Soccer which had made-up names due to licencing. Overall though if you wanted to play a WWF game on the NES then certainly with the different game modes and different characters then this would be the game of choice to pick up compared to it’s previous entry on the console, and coupled with Pro Wrestling makes a great tag team of wrestling games on the NES. It is not the first time this has been said about the NES system, but if there is one type of game that the NES was famous for was it’s platform games. It divides in to two different categories, the “normal” platforming games and the futuristic platforming games, neither of which is more beneficial than the other. At the end of the day, as long as a game is done well, with tight controls, half decent graphics and most of all very decent gameplay then it can be set in the past like Time Lord, or set in the future. So with today’s game, what category do you think this game falls into? You know it’s going to be awesome where on the box it proudly displays a password feature (akin to MegaMan being proud on the box of it’s state-of-the-art graphics), so how does Low G Man game fare in today’s gaming? Low G Man, or the full title as Low G Man: The Low Gravity Man is an action-platforming game set in the future, in which the idea of the game is to go from one side of the stage to the other, and defeating a mini boss at the end of each level to progress. Nothing too complicated but then you don’t need a complicated premise for the game to be good. The plot of the game again is nothing too crazy or unique – aliens take over a futuristic robotic planet and it is your job to save the world. What is unique to this game is that as soon as you turn the game on you’re immediately treated to the plot of the game – no developer logos and no straight to main menu like those other dastardly games. Thankfully you can press start to skip the intro scenes and go straight to the main menu, where you can start the game or enter a password. which is weird in that vowels and certain letters do not show – whether this is to stop rather “adult” passwords being used and spelling naughty words it is unknown however at the time battery back-ups were expensive and only certain games at the time had them so to have a password is nothing bad whatsoever, better that then nothing, having to sit through the whole game without a way to record progression. So when you start the game you’ll notice two things – firstly that you character can jump really high (which makes sense given you are the Low Gravity Man, which isn’t the best superhero name that could be given…) but second of all you have a gun projectile that doesn’t kill enemies. It doesn’t matter how many times you shoot at the enemy, they are frozen but are not killed, so it does take some thought to realise you cannot kill the enemy with the projectile. This is certainly a unique feature but seldom seen in games where it is the norm to kill enemies with projectiles. What it is is that the projectile is in fact a freeze ray which freezes the enemies – in order to kill them you have to press up and down and the attack weapon to spear the enemy to death – it resembles the weapon Donatello has from Teenage Mutant Ninja* (*Hero for those sensitive folk..) Turtles with a spear at the end. Throughout the game, you can pick up various weapons and power ups however the one issue is that when the power ups fall to the ground, they fall through the ground. It’s not like Contra in which the items are on the ground ready to be picked up – if you don’t collect the power up mid-air you lose it. This is slightly annoying as when you defeat an enemy more often than not they drop something however unless you have the reflexes of an eagle chasing a vole then you’ll lose the item never to be seen again. The controls are slightly more complicated than a normal NES action-platforming game. The A button jumps, however if you lightly press the button your character does a small jump whereas holding the button down does a big, low-gravity jump. The B button either on it’s own or pressing left/right and B fires your freeze ray or other power up you may have, up/down B wields the Donatello-type weapon to kill enemies and the start button not only pauses the game but brings up a weapon select screen. You choose from one of four weapons that when you start you have the freeze ray but can pick up boomerangs and other weapons. It’s nice to have more variety than just a standard A button jumps, B button fires a weapon and leave it at that – there is nothing wrong with simplistic controls because it can make or break a game but every once in a while it is nice to have something more advanced. The graphics resemble the future well with it’s bleak landscapes and defined graphics, but who knows what the future looks like? The enemies look different and although are killed pretty much the same way, it is good that there is variety in the enemies even though they can get pretty fiendish and you need to freeze your enemies to kill them. The music well that is okay, nothing that will get you humming to after you have turned off the game but it serves its purpose well and has various sound effects which compliment the gameplay. No sound effects for jumping but various sounds when firing your projectiles or hitting an enemy which is always good. So all in all, Low G Man was a surprising game to play and review. When you first turn on the game and start playing, you do wonder why you cannot kill enemies with your projectile weapon and find your health bar going down quickly. When you get to the grips with the game, with the low gravity and freezing the enemies or if you’re feeling braver to kill them with your up/down B attack without freezing, you find yourself enjoying the game more than you thought you would. There are a couple of issues with the game, firstly as noted earlier the fact if you don’t collect the power up in the air and let it drop then it disappears forever. Second of all it is a difficult game – not fiendish like other notorious titles on the system but it has a steep difficulty curve. You get enemies on the ground and enemies in the air so you have to have your wits about you and use your freezing ray well before killing them with the up/down attack. If you can get past this then you find yourself playing a half decent game that goes for cheap as chips online and in local retro stores so if you fancy a challenge and not want to play the usual titles, pick up the worst-sounding superhero of Low Gravity Man and save the world! Again! After a number of month’s, this site is back to doing what it does best – occasionally updating! But it is a new year with new goals and new challenges, so what better way of celebrating nearing the end of the first month by looking back at a classic game that started a franchise. It is easy with successful franchises like Mario and Legend of Zelda to look back and scoff at the simplistic graphics, gameplay and how it is inferior to it’s recent outputs. But what about a series such as Mega Man, how does it fare up today? Would it start off being mega, or anything but? Mega Man, also known as Rockman in Japan was unleashed onto the NES system in 1987 with it’s box depicting high resolution (but not HD) graphics and state-of-the-art….something. The box itself looks harrowing to say the least, with an Albert Einstein-inspired character in the top left looking pensively at a human-looking character firing a cannon out his arm. Mega Man is an action-platforming game in which if you didn’t know Mega Man then the plot isn’t necessarily easy to guess, as there is nothing when you turn on the game as to what the plot is about. But, for the sake of this review, the plot is that Dr Light who is a good guy created six humanoid robots who go crazy and being bad thanks to Dr Wily a.k.a Albert Einstein lookalike. You need to destroy these six humanoid robot bosses having passed through the stage, before a final show down with Dr Wily. So when you turn on the game, there is no developer’s titles, no schmaltzy backdrop and story to show you what is going on, you just get the title screen. Sometimes there is nothing wrong with this, as when you turn on the game you want to get straight into the action. You press the start button and you’re presented with six stages to do choose from: Cutman, Gutsman, Iceman, Bombman, Fireman and Elecman. You could hazard a guess what type of level each one is with Elec/Fire/Iceman but what kind of level is Gutsman, or Cutman? There are no clues but then life is full of surprises so why should the player be fully briefed what type of level is what? So having picked your level you then progress through the level until you get to the boss. Having completed the boss you then acquire the special power from that level, so for example with Bomb Man having defeated him you then acquire the power of the bombs which can be useful against enemies and certain bosses. If ever you know one thing about Mega Man it’s that is *balls hard*. It is that important that asterisks have to proceed and follow that statement but it is as hard as the asterisks make it seem. Mega Man is not a game for casual gamers, you will find a lot of time you will be shouting, swearing and wanting to throw your controller out the window. The problem is that unless you memorise the levels and the enemies within it, you don’t know what is coming up – you jump across a gap and then an enemy flies out of nowhere to knock you into the hole in the ground instantly killing you. Or, an enemy is on the ground so you cannot kill it by standing next to it and shooting, you have to jump on the platform below, jump up and shoot which you find doesn’t kill the enemy but paralyses them for a moment. What doesn’t help is that Mega Man’s moving physics resemble Luigi from Super Mario or if you run on ice in games – you start running but when you stop you carry on a little bit further. This doesn’t help when you have enemies that spring up from the ground and wasn’t expecting it, or on the ice level which you carry on moving even when you stop moving the d-pad, right into an oncoming enemy. Your reflexes and reactions have got to be sharp with this game, it isn’t one you can play lightly and without giving it your full concentration. In relation to the game’s controls, they are simple and straight forward enough – the A button jumps whilst the B button shoots your weapon. The d-pad makes Mega Man move which is straight-forward enough so who says that you need multi-button combinations to have a good game? The graphics of the game match the bosses well, moving from the deep reds and yellows depicting fire from Elecman stage, to the blue and white hues from Iceman stage. The colours are bold, bright and well defined – they pop off the screen and are great graphics for a game released early in the NES system. The music and sounds, well they are on point if ever there was – although you will find yourself repeating parts of the stage over and over again due to the difficulty, inadvertently you’ll find yourself humming the music which is memorable and classic. Mega Man is a difficult game to review, inasmuch the graphics, music and overall gameplay is great, but boy is hard. As noted above, the game is certainly not for casual gamers with plenty of swearing and shouting, and even with gamers who pride themselves on liking challenges, there will certainly be a lot of deaths and retry’s in order to get to Dr Wily for the final battle. If you can overlook the difficulty, then Mega Man is a great game and a wonderful start to the franchise, as were Super Mario Bros and The Legend of Zelda. Copies of the game are not the cheapest you’ll find for NES titles now, but certainly not beyond the realms of affordability, being cheaper than a title for current-gen consoles. It is a game worthy of your time and attention, with which if there was one piece of advice to give, then it would be to be patient. Try not to rush the game and take your time, with your reward being a completion of the stage, and your controller not being hurled out of the window or towards a loved one…. After what seems an eternity, time has permitted to sit down with NES controller in hand and play some NES – alas real life can get in the way of playing games and reviewing them which is no excuse, however at times this is reality. But enough on that, on with the review. With limited time what is the best game to pick up from the NES library? One of the benefits of the early NES games is that most were arcade ports of existing games or in fact arcade-based games with no discerning plot or story to try and work through, it was a simple case of getting a high score, having a certain amount of lives and aim for the high score. 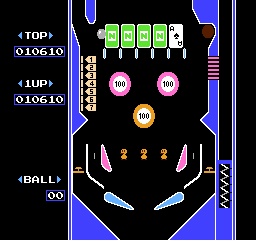 One game in particular that could fit the bill is Pinball, released as a black box title. So will it reach a high score or sink down the proverbial hole with no regret? Who doesn’t love big pink balloon-type text? 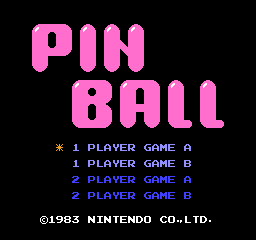 Pinball is, as obvious as it sounds, a pinball game released on the NES in 1985 based on a Game & Watch title of the same name released in 1983. The idea is to aim for a high score. Um….yes that’s it – no rescuing princesses who may be in other castles, no eating fungi and special flowers to obtain special abilities, just good ol’ pinball. Bounce the ball of bumpers, walls and other objects to increase your score in the hope that the ball doesn’t go dead centre down the hole or to the side out of the reach of a flipper to prevent the ball from going down the side into oblivion. Upon booting the game, like a lot of the black box NES games you get the choice of 4 modes – you can choose from Game Mode A or Game Mode B, and of which this can be one player or if you got a buddy next to you and you’re aiming for the high score then two players. The difference between mode A and B is that B seems faster and also it doesn’t remember progress made in the round when you’ve hit certain items so you have to start again and is more of a challenge. You do get a jaunty piece of opening music when booting up the game and then that’s it, no further music just sound effects. What’s disappointing however is that there is only one table to play on which is split over two screens – a top and bottom screen. The top screen has penguins and seals which don’t do anything however on the left hand side if you collect all the Pac-man pellets the seals start bouncing a ball on their nose which is okay but nothing spectacular. 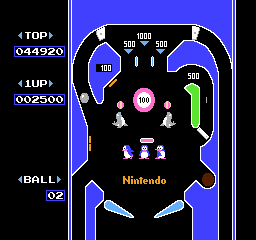 If the ball falls down the middle in between the two flippers, it goes to a lower screen which has numbers 1-7 on the left hand side to hit, three eggs which you hit to hatch (rather cruel one thinks…) of which if you hit them again, hitting all three you get plus that appear on the side of the table so that the ball can fall down the side, hit this plug to make sure the ball goes back in play rather than go in to oblivion. There are five playing cards as well which never got the chance in all the playthrough to turn over but will get more points no doubt. Finally, if the ball goes into the top right hand corner of the bottom screen, you get to a bonus game featuring everyone’s favourite heroine, Pauline! You bounce the ball off the paddle over numbers which change colour (of which was unable to make every number appear in the same colour) but if you destroy the platform she is on, then catch her for even more points – if you don’t then you lose, which is always nice. Bottom screen 7-numbered casino fun! In terms of controls, it is a bit bizarre in that the A/B button controls one paddle, and the D-button control the other paddle. It would have been assumed that say the A button controls the right paddle and the the B button controls the left paddle but no, why have that when you can use the d-pad too! The graphics are very average, very-pastel and nothing out of the ordinary which although isn’t necessarily a bad thing, it doesn’t evoke excitement in gamer’s eyes, the graphics are simple and do the job effectively and to be fair the penguins do look “totes adorbs” as the youth of today would say. The music well as mentioned earlier there is the jaunty opening music and then nothing. No game over music, no interludes in the gameplay, just basic sound effects. This reviewer is no game programmer and appreciate there may not have been enough room for much however surely more music even if looped would be better than nothing? Take out your headphones and listen to whatever passes as music these days because you won’t find much inspiration here. 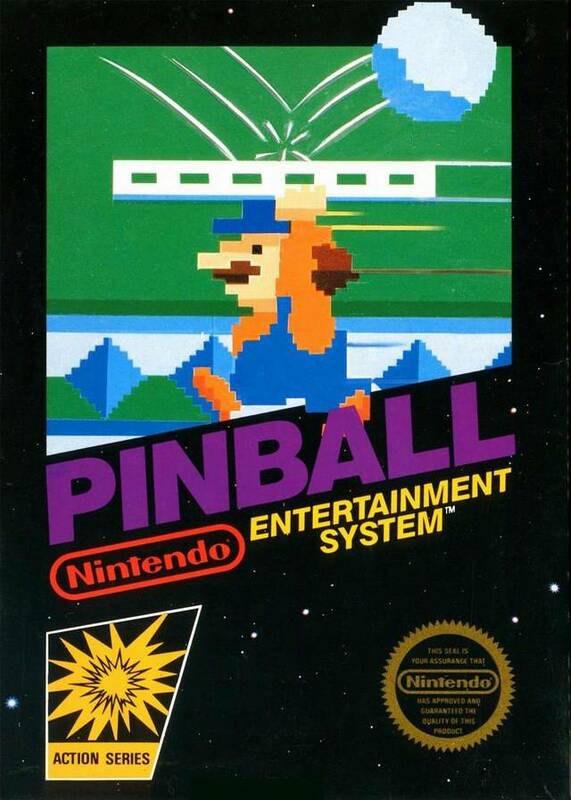 Pinball is a very standard game, with no music to listen to, very standard sound effects, standard graphics and a simple control system which could have been made easier with the buttons being remapped. 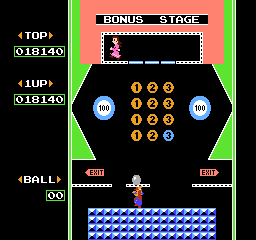 Although the bonus game with Pauline and Game mode B is a welcome challenge and runs at a faster speed, there is limited appeal to this game due to only having one table to play (even though it’s split on two screens) and no music to keep you entertained whilst you press the buttons in the hope the ball doesn’t randomly fall down the hole. Yes it is very easy to write this game off being 30 years old however there are other black box games which hold well now and are much more enjoyable if you had free time to wile away on – Pinball isn’t one of them. This is one for collectors only and with other pinball games available on the console, my recommendation would be to play a real pinball table – it is more of a treat to the eyes and ears than this. After what seems an eternity in the world of game reviews and it’s reviewers, this one is back with a bang – not a literal one but a metaphorical one. If you were to relate the bang to anything in particular it could be one of two things – 1. The sound of a skateboard constantly hitting the floor, or 2. The sound of an NES controller constantly hitting the floor. But after all this time, why the need for such violence and anger from a video game – is it something truly bad? Is it something that will induce cursing and the surrounding air to turn blue? That would be a matter of opinion but for now, let’s take a look at Skate or Die! (And no, the exclamation mark is not of excitement, but the game title – honest). Skate or Die! 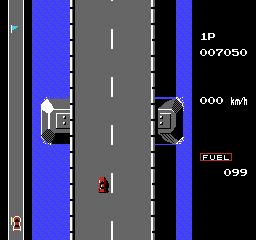 was released on the NES in 1988, or rather the port of the game was. 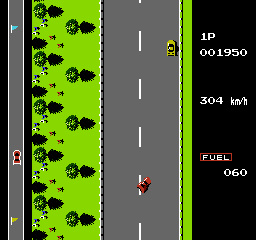 The original game came out on home cpmputers such as the Commodore 64, Sinclair ZX Spectrum and others to boot. As may be obvious in the title, Skate or Die! 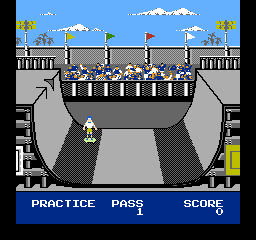 is a skateboarding game which in the same vein as it’s winter-themed successor Ski Or Die or even California Games (which is not winter-themed) it is a multi-event game for you to compete it and either beat an opponent or get a high score in. There are 5 events which will be explained in further detail below, but are: Joust, Race, Jam, Highjump and Freestyle. Joust – You and one of three computer opponents go into a large skating bowl armed with what looks like a giant cotton bud in order to knock your opponent off their skateboard, like Gladiators but on a skateboard. Aim towards your opponent with the d-pad and mash any button to try and knock them off – it is a guessin game what button does what so mash away and hope that you get to knock your opponent off. Race – You race against…yourself to try and get a highscore. The controls are severely delayed and feel like you have to press hard on the d-pad to try and turn your character. Rather than up to make your person move, this time it is down so for the first few seconds you’ll be trying to decypher this and wasting valuable time. 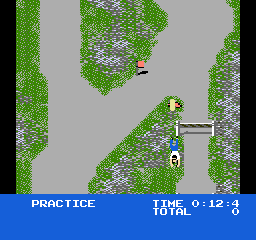 It is very easy to fall off the skateboard with the natural terrain and trying to jump with the A or B button causing you to easily crash. Jam – No not an eating contest trying to eat as much jam-covered skateboards as you can, but a race with another person! Yes it really is! 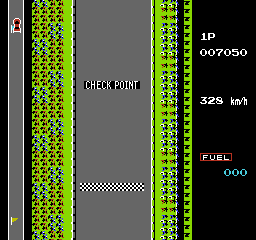 Again the controls are delayed but not as severe as “race” mode. The down button makes your boarder move, A + B buttons make the character punch which you can do against your opponent and the Up D-Pad makes you jump and do a 180, some of the time. 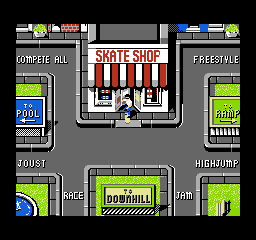 High Jump – move your character up and down a skate ramp trying to get him to jump on his board as high as possible. You try moving your character with the up key and it does….nothing. Try doing the down keypad and….again nothing happens. No, on this one you have to waggle the d-pad left and right to get him to speed up – the incosistent controls are getting a bit tedious, and to be honest this is 5 minutes you’ll never get back, wiggling the controller back and forth hopeing to get above a 5 or 6 meter mark. Freestyle – Again, your located on a ramp and using any button possible you have to try and do tricks. Another boring inconsistent mashup where more often than not you’ll be on your knees (not in a good way) with your board skating past you wondering where it all went wrong. Before you get to experience these fabulous events you get a main menu which is unlike any that you’d come across before. 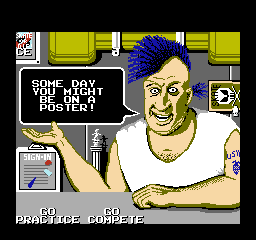 You move a cursor not of a mouse but with the game’s title written there and when it hovers a certain item on screen it causes the character, Rodney to quote a phrase such as “Doncha like my ‘do’ or “Semper Fi’ Or Die” – y’know such cool and rad expressions that only late 80’s and early 90’s skater dudes can say and pull off. You get the chance to practice these events or registering your name and competing for realsies. An innovative menu but alas it seems this is the only aspect of the game worth noting. It was with a heavy heart to review this game as having played California Games and the sequel to this game Ski Or Die, having put the game into the console and turning it on, the need to like it was obvious and had kept an open mind about it, but it seems the three multi-event games on this console suffer the same fate. 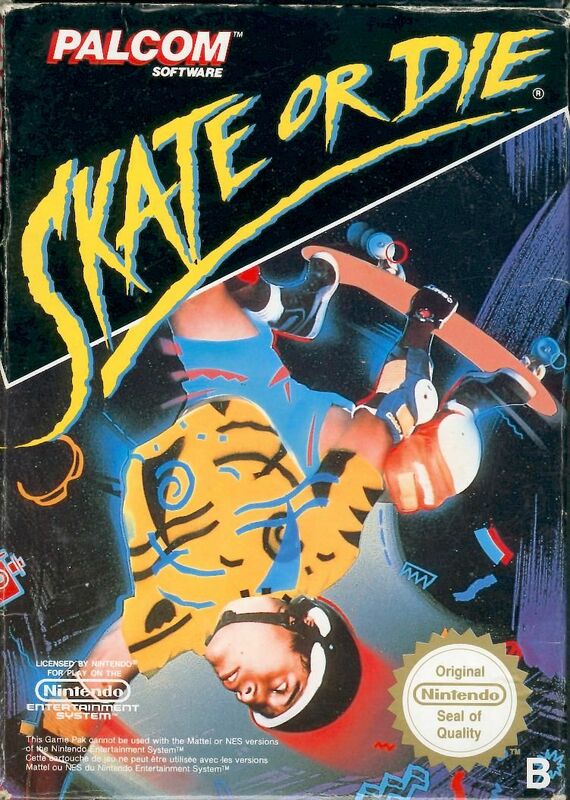 With Skate Or Die in particular, it suffers from unimaginative competition, uninspiring competition and sometimes invisible competition and has severely delayed controls which will cause an imprint of the d-pad to be etched on your thumb. It was a good idea in theory (what isn’t?) but the execution for this port doesn’t come off well. The graphics, well for the NES they are ok, it is this and the fact you get to choose your poison..ahem event that would mean it doesn’t get a lower score than what is noted below. But if you’re looking for a half-decent sports game to play on the NES then steer clear of this, anything that is multi-events can only mean one thing – multi-disappointment and that is not rad or not cowabunga…. In the 80’s, a wave of American culture landed on UK shores that would influence and shape a generation, things such as MTV, The Simpsons and American sports like Baseball, Ice Hockey and the sport for today’s review, Basketball. First played in the late 19th Century in a town named Springfield (not where Jebediah first founded) it would only have been a matter of time before a video game was based off the sport – why get kids out playing the real sport when they can put on their Nintendo and play the video game of it? Konami hit on this brainwave and released Double Dribble, so how does it fare – is it a 3 pointer or a non-starter? Someone call pest control – we gotta problem! Double Dribble started life as per a number of early NES titles as an arcade game released in 1986. 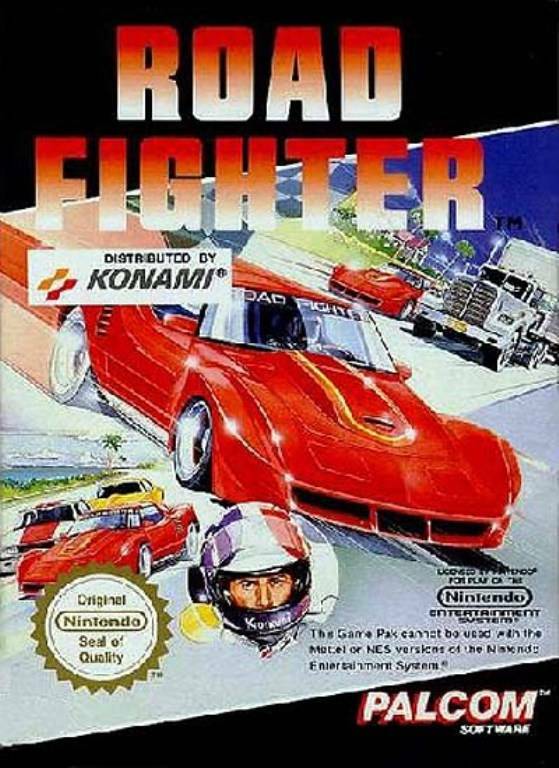 Due to the popularity of this, Konami thought (and rightly so) that it should be ported to home consoles, which it duly released in 1987. Double Dribble is a basketball game in which as per most sports, the idea is to score more points than your opponents. The rules and scoring of basketball won’t be covered here however there are plenty of fine resources out there that would describe the sport, so let’s assume you know the basics of the game. 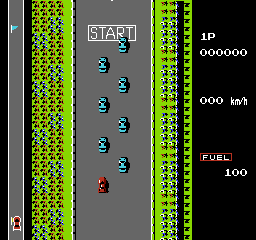 When you pop in the game you can choose between one player game versus the computer or playing against a friend in local multiplayer which is always favourable – online multiplayer at this stage was not fully designed or implemented on the NES…so you choose which mode you wish to play and then you’re treated to an opening scene of what looks like hoards of moles burrowing underground make their way to a Kremlin-like building (such is the graphics in the opening segment) whilst the US National Anthem plays in the background. A nice touch and adds to the charm and appeal of the game. 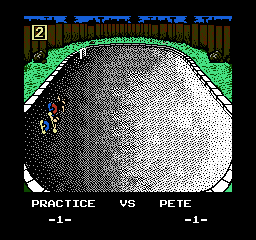 You then get to pick your options before the match starts, which was common for sports games on the NES at the time however to choose your options your player shoots the ball into the net to change the setting. Firstly it’s time, so you can play a 5/10/20 or 30 minute match, then which team out of 5 to choose from you want to be (surprisingly no option for a London basketball team – maybe London wasn’t glamorous enough at the time…). Then you get to pick the level of difficulty from 1, 2 or 3 before starting the match. The one criticism here is that it takes too long to cycle through the options – what is wrong with pressing left or right to choose your team or match length? Instead your waiting for the guy to shoot the hoop which draws out the process. So the match starts, and the graphics suit the game well and are of good quality, which isn’t surprising as Konami were the publishers of the game. There are the odd quirk here and there, such as in game the player’s skin colour can change (which is more evident when the player you are in control with “flashes”) but in the background you can define the crowd and is a nice touch when you can see them pumping their fists in the air like they just don’t care and supporting team. 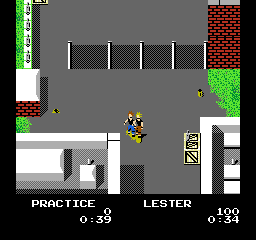 The centre piece of the game is when you go in to the dunk the ball into the basket, a cut scene appears – for the time this was mightily impressive and felt realistic. It doesn’t matter how many times you see the cut scene, it always does bring a smile to the face and the following shouting at the TV wanting the ball to go in the basket to get your two points. The controls are responsive and tight, with the d pad (unsurprisingly) moving your player, the A button passing the ball and the B button changing the player you are controlling and also shooting. Although there may be a button to press to tackle the ball from the player, having tried all combinations it is difficult to know what this is, which for a sport’s game as much as the offense is good, you need to know how to defend. The sound effects at times can sound like they were direct from the Atari 2600 however hearing the beeps go up in pitch when you are in control of the ball is a nice touch, the ball being bounced is a nice effect and there is some voice sampling which is always a welcome especially on a console like the NES.